Instead of a Newsbytes today, I’m just going to get to one piece of news really quick as time is up. So Newsbytes will be on Monday again. Hectic, hectic, hectic! 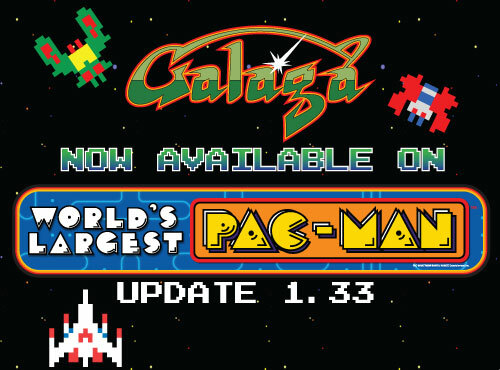 Upon release, that changed with Galaga being pulled and Pac-Man with a unique co-op mode added. There was discussion that Galaga would return but it had eluded us until EAG 2017, when once again the game was seen to feature the beloved Galaga. Now operators with World’s Largest Pac-Man games can get the update for free (contact your distributor for details). If you want to call it the World’s Largest Galaga, that will work too! In the email that Namco sent out to promote this link, they also provided a detailed changelog. For the most part, this is just to cover the addition of Galaga but it is always nice to have some bug fixes on top of that. I find it interesting that one can run it as Galaga only – while I imagine you would want to run both, there might be special events where it can be worth limiting it.